Person 1 threads the rope, attaches their device, and rappels to the next anchor. Meanwhile Person 2 is standing around staring off into space and getting cold. Let’s not forget about Person 3 who is probably doing absolutely nothing and is annoyed to be waiting around. After an eternity, Person 1 finally yells “off rappel,” signifying that Person 2 can attach their device and rappel. All the while Person 3 is still hanging out at the anchor doing nothing useful and now mildly hypothermic. Finally Person 2 is done rappelling, yells “off rappel” and, if Person 3 can actually hear Person 2, Person 3 can finally get moving. No wonder people think this method is slow…It is! Here’s a much faster way to descend with three people, all of whom want to rappel. Let’s define possible roles for each person. Person 1: Competent to rappel without backup. Takes the lead finding/building the next rap station. Person 2: Competent to rappel without backup. Responsible for not knocking debris down on Person 1. Person 3: Might need a “fireman’s belay” backup. Is responsible for removing any backup anchors from that rappel station. Also responsible for not clobbering Persons 1 & 2 with debris while rappelling. Person 3 attaches their rappel device to both strands of the rope. He uses an extension (typically a sling basket hitched or girth hitched to his belay loop) on his device, moving it away from his body so he doesn’t get tugged around while Persons 1 & 2 rappel and he has better control of his rappel. Persons 1 & 2 attach their rappel devices–each to a single strand or rope. They use two lockers, instead of one, to increase friction to maintain better control of their rappels. They each attach a backup autoblock hitch to their rope strand. Persons 1 & 2 rappel to the next station simultaneously. Since Person 3 has both strands in their device, Persons 1& 2 are not rapping off each others body weight, but rather on isolated strands. Thus, they don’t have to worry about unweighting the rope and killing their partner, hence they can move faster and be more secure. Persons 1 & 2 find/build the next anchor, clip in, and remove the rope from their devices. One of them gives a “fireman’s belay” to Person 3. 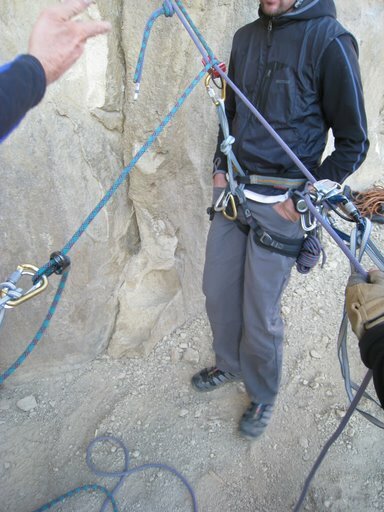 As soon as Person 3 can lift the rope (indicating that his partners are off rappel), he removes any backups and starts his rappel. So there it is, one safe and fast method of rappelling with a party of three. Now if only we could get our rope management skills as efficient…but more on that later!